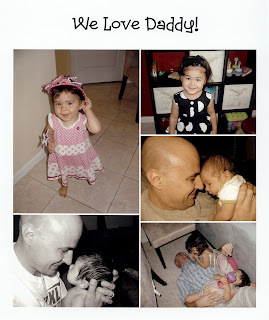 Here are a few of the many special things about our Daddy. This was written by Mommy, but I know the girls are blessed by them, too. 1. After a long day of work, Daddy always sits on the seat next to LittleBit's highchair so that he can feed her. He knows that Mommy had to feed her throughout the day, and she is ready to sit down and actually enjoy a warm meal. 2. When Daddy sees either of his girls, his whole face lights up and enthusiastically shouts, "Hi, Beautiful!" like he's never seen anything so precious in his life. I love that they'll never have to doubt their worth and true beauty, because they've been told by their daddy how beautiful they are every single day of their lives. 3. All of us love the fun Parry lingo Daddy started in our family, like "Tootie-kissie" and "Bear (ROAR) Hug" and "Noggin." 4. Whenever possible, Daddy gets Peanut up and has breakfast with her. One of her favorite things to do is to "have cereal with Daddy." I love watching the two of them sit next to each other and throw cheesy smiles at each other as they eat their bowl of cereal. 5. Daddy slowly drives away from the house in the morning, so Peanut can wave to him from the window. 6. When we go to parties, Daddy always makes sure to keep the girls busy so that Mommy can get food and eat (hmm, this post has been very revealing about how much Mommy loves to eat). 7. Whenever possible, Daddy lets the girls help him with his projects/tasks. 8. Daddy loves to get on the floor and play with them! This does not come naturally for Mommy, so I'm thankful that they have such a fun Dad. 9. Daddy ALWAYS has Mommy's back (especially when it comes to discipline). Daddy and Mommy are always on the same team. 10. For all of these and more, we think our Daddy is the very best God chose for us, and we can't thank Him enough! Happy Father's Day! So it’s almost June of 2011 and I have not completed my wrap-up post for 2010. This shows how insanely crazy our 2011 has been so far. I do plan to create a new blog in the near future, but I wanted to have a proper closure for this blog with a final wrap up post. Thank you to everyone – anyone – who has read any part of this blog. This is the summary of my “Extraordinary 2010.” Very contradictory to my nature, I will keep each point short. E – Ever more so in love with Jesus. Just that. The longer I live, the more in love with Him I become. X – Xtra dose of inspiration. I was inspired by so many people and resources around me. Jeff and Dusty. Kristi and her family. Shine. The Chapman family. Riley and her family. Growing Kids God’s Way curriculum & conference. T – Temporary vs. Eternal. This was probably the biggest benefit to keeping a blog for 2010. It helped me to keep things in perspective…what’s really important and what’s not. What should take priority over other things. What really makes an eternal impact and what doesn’t. R – Rainy days. Like any other year, we had our share (see Simple Trust, Health and Finance). God showed Himself faithful, as always (see Great is Thy Faithfulness). A – Another baby. Hmm, yes, as cute as they are, and as easy-going of a baby Little Bit was, having two definitely has been no easy task. Allan and I are still not big fans of the newborn stage. O – Organizing and facilitating a parenting class. What an endeavor – we learned so much through the curriculum and through asking my mentor about the questions that would come up in class. Great times. R – Running. I started to run. There are so many principles I learn about my relationship with God through running. Maybe I’ll blog about that someday. D – Doing life together with family and friends. This is what us Parrys do best. Aside from loving God first, we love people! We love spending time with people. Just like any other year, 2010 was full of visitors – and we also took a trip to visit family in Boston. I – Increase and expansion of Allan’s business. With this blessing also came added stress. We had to reprioritize and reorganize our schedules and tasks. N – No longer in 30’s…for my husband, that is! We celebrated his big 4-0 (and our friend Paul’s) through a surprise party. A – Alisa (Peanut) is still a hoot! Two-year-old stage was even more challenging than the previous years. Potty training was a long process. She began preschool and had a blast from Day 1. R – Relaxing holidays. We really enjoyed a stress-free holiday season this year. Our schedules were not too crammed, and we kept shopping to a bare minimum. We just enjoyed and celebrated each other! Y – Year-End Celebration = LittleBit’s 1st birthday! And there was no better reason to celebrate. This baby girl brought so much JOY to us and Peanut during her first year. Since the day she learned to smile, she never stopped. Since the day she learned to giggle and laugh, she never stopped. Joy, joy, joy. We also LOVE watching the development of a lifelong bond between our two daughters. How blessed we are! Thank you again, for peaking into a part of my life through this blog. At this rate, I don’t know when my new blog will be ready, so I will continue posting periodically on this blog for now – so please stop by again. For Christmas, my husband bought me the book Choosing to SEE by Mary Beth Chapman. I’ve been so inspired by this family since their tragic accident, and even more so this year when Allan and I had a chance to see them in concert a few months back. For those of you who may not know, Steven Curtis Chapman is a well-known Christian singer/songwriter. I’ve been listening to his music since I started attending a Christian school in seventh grade. I was always moved by Steven and his wife Mary Beth’s story of adoption. After they had three children, they decided to adopt three girls from China. On May of 2008, a tragic car accident took the life of their youngest adopted daughter, Maria. Their son Will was driving the SUV that hit Maria (You can watch a recent interview with the Chapman family on Good Morning America by clicking here). From the day of this terrible accident, this family has constantly poured out to others with their songs and stories of HOPE that they have gained through their darkest moments. Mary Beth published an autobiography that described the journey of her life, and how she had seen God’s hand every step of the way. No words would give justice to how inspired I was. I read it in three days (it would have been one day if I didn’t have two girls to take care of!). She was brutally honest and open in her book. She described her pain in such authentic and tangible ways. I cried a lot (sometimes uncontrollably), but her sense of humor also made me laugh out loud many times. Her message was clear: the pain is REAL. It hurts. Many times, it’s unbearable. But because she has God, she has true HOPE. She can choose to SEE this hope in midst of her pain. Steven also shared the history behind this hymn. The writer of this hymn, Horatio Gates Spafford, had received news that his four daughters were killed in a shipwreck. While sailing across the Atlantic to reunite with his wife (the only survivor in his family from the wreck), he was shown the place where his daughters had died. He then went into his cabin and penned the words above. It’s hard to believe that someone can truly say, “It is well with my soul,” after such tragedy. Yet after reading Mary Beth’s book, along with other stories of real hope I’ve encountered, and even reflecting on my own life, I know without a doubt that it was not a fake front that Spafford was trying to display. Even in midst of the most unthinkable pain, even when you don’t know if you can breathe, there is hope that can only come from God. It surpasses human logic. It surpasses all the painful emotions. It’s rooted in the deepest part of our being…that’s the part that he knew was going to be OK. Why? Because God dwells in that deepest place, along with all that comes with Him (His peace, His strength, and even His joy). It doesn’t mean it won't be difficult, but God provides the strength. It doesn’t mean it won’t be painful, but God provides the comfort. It doesn’t mean there won’t be despair, but God provides the HOPE. There’s a voice that’s louder than the pain that says, “You are mine. I am with you. You are going to be okay.” How do I know this? Because although I have not experienced pain to such depth, I too have heard this same voice many times…and it’s been more real to me than anything I’ve heard with my ears. My prayer is that whoever is reading this…that you truly have this HOPE that goes beyond yourself and this world. Hope that you can cling on to, even in your darkest hours. This hope has a name…His name is Jesus. PS. I will be posting my final post for this blog soon. I plan to start another one in February (which will include the stories of FaithHopeLove that I mentioned a few posts back). Ephesians 1:11 (The Message): It's in Christ that we find out who we are and what we are living for. Well this last month showed how I can be when I don't rely on God to keep me in the right focus. I did exactly what I said we shouldn't do in my last post (which I had actually written at beginning of November). Since then, I became consumed in the busyness of the holiday chaos and lost sight of what's really important. Things were going well until the Be Her Freedom Run. I had a great run, and I was determined to keep the right perspective as I entered the holiday season. I then went into a "vacation mode" when my hubby went away to deer camp and my best friend from college came to visit for a week. That was a fun week. After she left, my hubby returned, and life went back into the routine. Instead of regaining my focus though, I found myself getting overwhelmed in all my everyday affairs. I don't even know all of what took place; I blinked and now we're way into December. During this past month, I'm sad to say, I did not spend my daily time with God and His Word. I stopped going to the gym, which was usually time spent not only releasing my stress by exercising, but also gaining some valuable insights and wisdom through the podcasts I'd listen to. I basically became unplugged to the True Source (as the verse above says) of who I am and what I'm living for. And it showed. I knew something was seriously wrong when my husband humbly suggested that we should reexamine our daily tasks, because the stress is getting to me too much. I was very irritable and short with everyone around me. I became stressed way too quickly and easily. I had no peace. This is who I am when I'm unplugged from my Source, when my focus is off the eternal perspective and purpose. I became consumed with all the temporary things. I hated that our house is not as festively decorated as others. I felt so guilty that a year later, our youngest LittleBit's room was still not decorated. I felt that I needed more clothes for myself and nicer things for our house. All of a sudden, there were so many things "lacking." What a difference from when I wrote this post: My Wish List. I also began to take it out on my family. I grew up as an only child, always having control of my surroundings. I became angry every time I couldn't have complete control because one of my children did something unexpectedly. Ephesians 1:15-19 (The Message): I ask—ask the God of our Master, Jesus Christ, the God of glory—to make you intelligent and discerning in knowing him personally, your eyes focused and clear, so that you can see exactly what it is he is calling you to do, grasp the immensity of this glorious way of life he has for his followers, oh, the utter extravagance of his work in us who trust him—endless energy, boundless strength! How Great is my God. Thank You, Jesus, that You are always my source…of wisdom and strength and purpose. Even when I lose sight, You always bring me back to You. In You I always find who I am really meant to be. PS. In midst of all this, perhaps due to the stress, I've been having trouble keeping weight on. I know that many would consider this a good problem to have, but as most of you know, I don't have much weight I can afford to lose. We're trying to figure out a right diet for me to gain more calories. I'd appreciate your prayers. As the holidays approach, it’s sometimes easy to get consumed in the “busyness” and lose sight of what’s really important. We spend so much time preparing costumes, decorating the house, preparing big feasts, etc. I’m not saying it’s wrong to focus on holiday traditions. In fact, family identity is often strengthened through traditions. However, as with all things, we must keep a balanced perspective of what’s temporal and what’s eternal. This year, more than ever before, God has pressed firmly on my heart that the “here and now” is not our eternal home. This life is only temporary. The costumes, the decorations, the gifts, and the feasts will all fade away. My child’s spirit will last forever. I know that holiday traditions do play a role in building security in my child’s spirit…they help her to know she has a family full of love and laughter. But does she also know about giving as much as receiving? Does she know about serving as much as being entertained? I do not throw the best birthday or holiday parties. I do not know how to sew, so I don’t even try to make my children’s costumes. My cooking skill is only so-so, and I do not know many nursery rhymes. I realized though that these things fall more into the “temporary” category. They are not bad things to focus on, but at the end of the day, I want to make sure I’ve spent more time and energy on eternal values. How did I help my child to experience God’s love today? How is she learning to demonstrate virtues such as self-control and kindness? How did I help her to cultivate healthy relationships? During the holiday seasons, I want our family traditions to look like this: we have fun going trick-or-treating, then the following weekend we always participate in the Be Her Freedom Run as a family. We enjoy a big feast with our extended families for Thanksgiving, and we visit the elderly people who do not have a family. For Christmas, the children choose one item they received to give away to a child who didn’t receive any gifts. My dream is that my children will become world-changers for God. My dream is that when they grow up, they will say, “My mother made our holidays fun, but more importantly, she paved a way for me to discover all that God has called me to be.” My dream is that they will impact their children’s lives for eternity. Lord, help me to use every moment I have with them to make this dream into a reality. I'm still in the process of posting my first FaithHopeLove story, but there are a couple of events happening next week that I wanted to call everyone's attention to. The main reason I'm writing today is to ask for your participation in either or both of the two upcoming events our family will be a part of. This year, more than ever before, God has pressed on my heart that my life is not about the "here and now" - it's not about getting what I want in my life, achieving the American dream, and living for the temporary things that will fade away. It's not even about having a happy family, good friends, and a successful career. Those goals are not bad, but God's purpose for my life goes way beyond that. It's about making a true, lasting difference for God with His love. Allan and I both feel strongly that this is the kind of perspective we desire to instill in our children: it's about giving, not receiving. It's about serving, not being served. It's about making eternal impact, not gaining temporary satisfaction. Our girls will be right alongside us (in their double stroller) as we participate in these two events, which we believe God will use to make eternal impact in the lives of many. Please read the description about each event and how you can help in either (or both). Your participation is greatly appreciated. Please visit our team's webpage and read about our friend from church, Dusty Williams. She has recently battled Leukemia and is now in remission. You can donate through our team's webpage. Slavery and human trafficking still exist in America and all around the world. Be Her Freedom Run was organized to raise awareness of this crime and to raise funds to rescue young girls who are victims of this crime. Please visit the Be Her Freedom Run website for more info. If you live in the Jacksonville area, please consider participating in this run/walk (you can register through the website). If you live out of town and would like to donate, please send your donation check to our church address below (please be sure to make a note on your check that it is for Be Her Freedom Run). You can also send a fax to the church with your credit card number. For close families/friends - if you were kind enough to consider giving us a gift for Christmas or birthdays, please consider giving to either event instead and we'll accept them as your gift to us. Thank you! 1 Corinthians 13:13 (New Living Translation): Three things will last forever – faith, hope, and love – and the greatest of these is love. So how do I live my life in a way that makes a difference for eternity? God’s Word says that three things will last forever: faith, hope, and love. I desire to display faith, hope, and love through every detail of how I live my life. I also desire to write stories of many others who live out their faith, hope, and love. Now at this point, I must set and explain the prerequisite for the stories of faith, hope, and love that I am planning to share on this blog. These faith, hope, and love that the Bible talks about – it’s not referring to any kind of faith, hope, and love. Bible is clear that Jesus, the Son of God, is the source of true faith, hope, and love. I know that I am making a very bold statement and may even have offended someone just now. Some may call me an elitist, or narrow-minded, or naïve, or simply wrong. However, if you’ve spent any time with me at all, I hope you know me to be a person who is well-grounded, sensible, and humble. I also hope that you see my life as one that displays faith, hope, and love on a regular basis. How can I be convinced that only Jesus is the true source of these things? First, as I already stated, God’s Word (the Bible) proclaims this truth; secondly, God’s Holy Spirit confirms this truth to me; and thirdly, what I’ve experienced in my life and what I’ve seen/heard others experience all reaffirm this truth. These God-written, real-life stories of faith, hope, and love – they are what I desire to write about from now on. I plan to include my own stories along the way. Whether you agree with me or not on Jesus being the true source, I do pray that you’ll take a moment to read my stories. I’ve walked with God for more than fourteen years now, and I’ve found this verse to be true time and time again: “To You they cried out and were delivered; In You they trusted and were not disappointed (Psalm 22:5).” When people’s faith, hope, and love are placed in God, they are never disappointed. Without a real, personal relationship with God through His Son Jesus, I do not believe the same level of faith, hope, and love is possible to experience. You will discover in my stories that these people who placed all of their eggs in one basket (Jesus) had peace and strength in midst of their darkest circumstances. It’s the kind of peace that does not make sense or is uncommon to rest the world. However, the common denominator of all these stories is Jesus. When we draw our faith, hope, and love from Him, we never run out…in fact, we receive added blessings such as peace and strength. Again, my truest intention is not to offend anyone. I desire, from the bottom of my heart, for everyone that reads my blog to experience this extraordinary faith, hope, and love. Ask yourself this in all honesty: Do I have the kind of faith, hope, and love in my life that never disappoints me? If you don’t, I ask that you open up your heart, and allow these stories to inspire you to seek the same kind of faith, hope, and love. If you do, I pray that your faith, hope, and love will be strengthened to even a greater level after you read these stories.